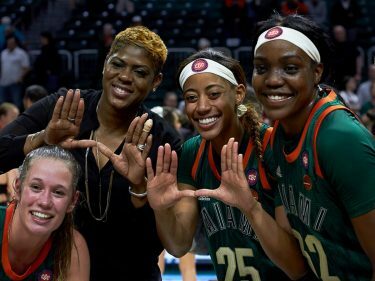 The Miami Hurricanes men’s and women’s basketball teams will welcome fans to the BankUnited Center on Oct. 18 for “Hurricanes Hoopfest ’08,” an event for fans, and especially those interested in purchasing season tickets for either team. The day will feature an open practice, autograph session with both teams and an appearance by Sebastian the Ibis. The men’s team is coming off a remarkable turnaround season in which they were projected to finish last in the Atlantic Coast Conference and wound up making the second round of the NCAA tournament. The team returns most of that nucleus, including senior guard Jack McClinton. The women’s team is rebounding after a 9-20 season, but is bringing in a McDonald’s All-American in Shenise Johnson, rated No. 11 in the country by Slam Magazine.